I never finished the story of where CC, Ish and I went on our mini-break in December, so I haven’t told about the best part. 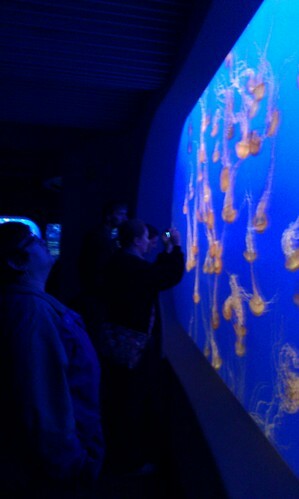 Our final destination was one of my favorite places on earth: the Monterey Bay Aquarium. In fact, I love it so much that I want my carcass turned into fish pellets and scattered in the tanks… Ok, maybe half my carcass. Cremate the other half and put the ashes in a can on a back shelf at Zabar’s Deli, where I’ll be surrounded by the things I love, like cheese strudel and chocolate babka. ANYWAY. Moving on. 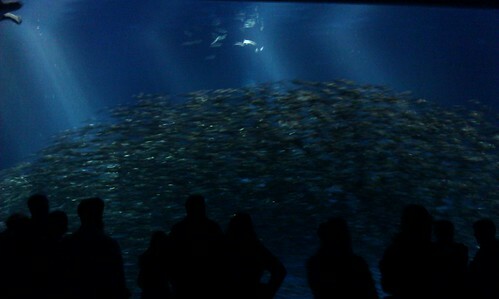 Monterey Bay Aquarium. Thanks to TripAdvisor, we once again found clean, comfortable, cheap accomodations with an on-site owner manning the counter. I asked him if they sold aquarium tickets there at the motel. “Just two-day passes,” he said as if that would be something no one could possibly want. “Oh, they’re the same price,” he said. Two days for the price of one. Rule Number One of Travel: Ask lots and lots of questions. 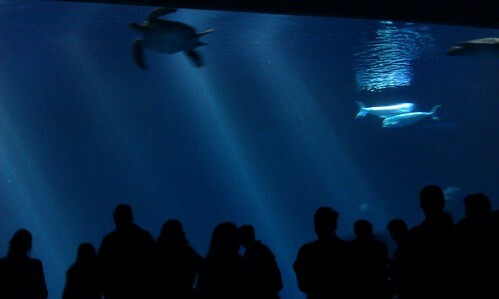 We purchased the passes from him and made one of the best possible decisions: even though the aquarium was only open for another two hours that day, we went anyway. This gave us time to see the place when it wasn’t mobbed with people and to get a mental map of the must-sees for the next day. 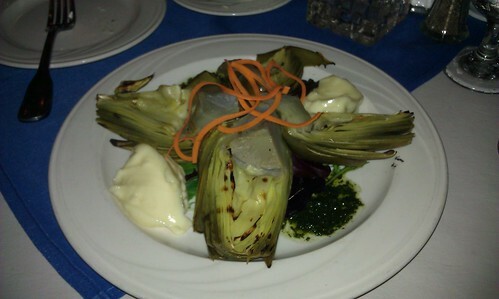 We asked a docent from the aquarium for dinner advice, since CC wanted clam chowder and Ish wanted calamari. She gave us a lengthy, enthusiastic answer full of good advice: go to Fisherman’s Wharf, where all of the restaurants have little stands outside offering free clam chowder samples. They also hand out coupons for a free calamari appetizer. Rule Number Two of Travel: Ask someone who looks really bright for advice. We made the 15-minute walk down to Fisherman’s Wharf and CC and Ish began the arduous trek of tasting all the clam chowder samples. There must be at least 10 places offering them. They made it through five before we decided on a place, Domenico’s, with decent chowder and a vegetarian menu with more than one item on it. One other place had better chowder, but NO vegetarian food, so let this be a lesson to restauranteurs – accommodate one person’s special dietary preference or lose the whole table. In the end, CC was sick of chowder from tasting so much and didn’t even order it, but dinner was good and had a great view of the harbor (note: all of the places on Fisherman’s Wharf have a great view of the harbor because, duh, wharf). That night, I checked Yelp and found a great breakfast spot for the next day. 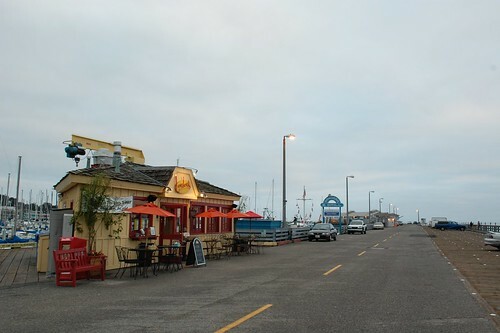 Loulou’s Griddle in the Middle is a tiny little breakfast grill smack in the center of the Municipal Wharf #2, where we ate brulee’d oatmeal (me and CC) and alder-smoked bacon (Ish) as the sun rose and turned the sky peach and apricot and burned the lacy fog off the surface of the perfectly still bay. Loulou’s Griddle in the Middle. Photo by Adam Burke. Used under a Creative Commons license. The helpful docent had also tipped us off to arrive at the Aquarium at opening, because they expected a very busy day, since it was the week between Christmas and New Years. As it turned out, it was the busiest day they had ever had. We were glad for the pre-purchased passes, which allowed us to zip in through a short passholder line. 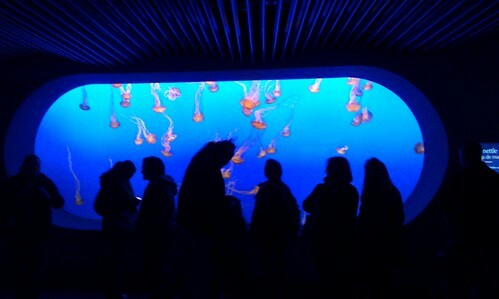 We spent the day in wonder at the three-story tall kelp tank; the deep-sea tank full of sharks, giant sea turtles and bullet-fast silvery tuna; the playful sea otters who chase each other in streams of bubbles; the quiet, shy and amusing sea horses and all manner of other critters. The hilarious counterpoint to our experience of undersea mystery was Ish’s earnest, constant narration of “These are really good eating,” whenever he saw a species he liked the taste of. Eventually the masses of excited children, not all of whom were extremely well-behaved (note to children: saying “Excuse me,” is not a free ticket to shove your way to the front of exhibits) and many of whom were screaming wore us down. We stumbled back out into the light at about 2 pm and hit the road south, talking of squid and seahorses. CC watching the jellyfish. Better than meditation. What a great little trip to go on. Did you pet the Ray fish in the petting pool? I love doing this as they’re so interested in being touched they will attempt to climb up the side of the pool out of the water to get closer to your petting hand. Love that. No, I didn’t. I didn’t know they LIKED being petted. I thought it was kind of intrusive, so I held back. Next time I will pet them! i’ll be back in california, hopefully in april. would you mind sharing the name of your hotel?